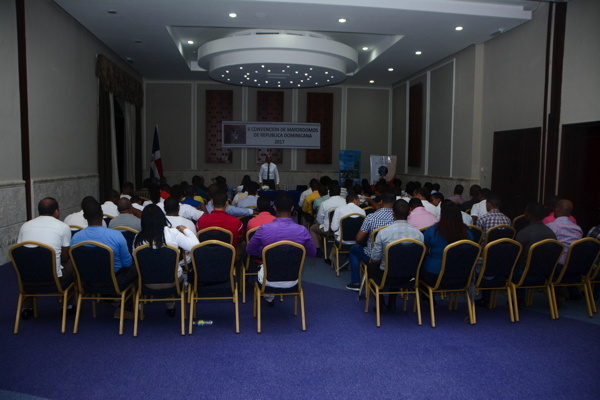 Last March 22nd, in the Conference rooms of the Iberostar Grand Bávaro Hotel in Bávaro, Punta Cana, the Head Butlers, Supervisors and Human Resources, Training and Development Managers of 21 hotels of the area gathered together to hold the 2nd Convention of Hotel Butlers of Dominican Republic. The event was summoned by the Association of Eastern Hotels (ASOLESTE) and the Experience Hospitality Consultancy, specialized on the training of hotel butlers, and with the sponsorship of Iberostar Hotels in Dominican Republic. The Conference was presided by Mrs. Janette, Vice-president of ASOLESTE and Mr. Osvaldo Torres, President of Experience Hospitality Consultancy and International Trainer of Hotel Butlers. 1 – The goal of this position in hospitality. 2 – Advantages of having a hotel Butler: For the business or the guest? 3 – The profile for the selection of candidates to this position. 4 – Designing of the job duties. 5 – The hotel Butler as facilitator of processes. 6 – The position of a hotel butler and interdepartmental relations. 7 – The hotel butler and the management of the guest´s information. 8 – Hotel Butlers, a job for men? 9 – Designing the training of Hotel Butlers. 10 – Hospitality schools as job bank for Hotel Butlers. 11 – Creation of the Association of Hotel Butlers of Dominican Republic and its role in positioning the country and as a major tourist destination in the region. a) Getting to know the guest in a deeper and more direct way. c) Establishing a direct relation with the client. d) Increasing the hotel competitiveness. g) Designing and managing the experience of the clients. 2 – The highest benefit and functionality of this position is, no doubt, for hotel businesses because through the Butler they can increase the information about the clients and, therefore, establish higher levels for customizing the services offered, reducing their complaints and enhancing their loyalty. Mr. Osvaldo Torres stated that, independently of the great benefits a Butler can yield to the business, many hotels cannot appreciate that, and refuse to develop this position by arguing that their guests do not need them. 3 – In respect to the selection of the people for this position, attendees stated different ideas that caused an interesting debate on the need to ¨culture¨ hotel butlers by developing their analytical thinking. Conventioneers agreed that a high percentage of active butlers in the hotels of the area do not have the necessary level of education, and they urged them to get at least a higher certificate. This will enable them to improve the quality of the services they provide to clients, as well as establishing and enhancing this position in the hospitality industry. Also, they stated the need to have command of at least two foreign languages to facilitate their communication with the clients. 4 – As to designing of the duties of the Butler, it became evident that they differ between hotels considering the job descriptions in relation to the needs of the property. Mr. Osvaldo Torres stated that it was an unfortunate situation that in many hotels butlers are assigned tasks that do not correspond to the main goal, namely ¨being right in the time and place the guests are in order to be acquainted with them and offer them a customized service and, consequently, achieve results to their satisfaction¨. Participants agreed that in many hotels the Butler is considered a supervisor to other departments and the number of operational tasks they have to carry out Is higher than the service ones, and this draws them away from the direct contact with the guests in the different spaces where they are. In answering the question about how many rooms a butler should attend, Mr. Torres Cruz said it was not a question of the quantity of rooms, but rather of the number and type of tasks they are assigned to allow them contact their clients at least three times a day, thus facilitating the flow of the services they request. 5 – Concerning the vision of the Butler as a process facilitator, participants debated about the need they have to know and master all services offered in the hotel so as to facilitate their flow. This implies that there should be no territorial barriers in any department, but, unfortunately, this is not the case in many places, and the butler is thought of as a position that generates ¨extra work or efforts¨ to the departments they interact most (mainly, Food and Beverage, Housekeeping, Maintenance and Reception). Mr. Osvaldo Torres reasoned that a Butler should, above all, be humble, courteous and a good relations maker, so as to have allies in the hotel, as demanded by his/her role as the process facilitator between the guest and other departments. 6 – Fortunately, some of the participants were female butlers, so they could discuss about the role of women in this position. They acknowledged the advantages they get across to this position, namely, attention to details, refinement in the service and a more creative management. They also recognized they have found no obstacles to be accepted as butlers in the hotels where they work, neither by the business nor by the clients. Mr. Osvaldo Torres talked about the importance of keeping increasing the number of female colleagues in this position and to balance the percentage rate of men/women in each team work. a) Paying closer attention to the process of selection in hotels in respect to the aptitudes and attitudes of the applicants in order to strengthen and position the image of a butler. b) Creating appropriate training programs to guarantee the quality of the services offered to clients. c) Creating connections and links with the schools of hospitality to make known and promote this position among the students in order to include it as another job offer once they finish their studies. 8 – Finally, Mrs. Janette and Mr. Osvaldo Torres threw the idea of creating the Association of Hotel Butlers of Dominican Republic with the purpose of promoting the development of the position in hotels throughout the country and the continuous training and cooperation among themselves. Before the end of the sessions, Mr. Amando Pozo, Manager of the Iberostar Grand Bávaro Hotel, talked to the participants about the importance of this position for a hotel business and shared his personal experience as a manager in relation to this position in his hotel, and how it has significantly contributed to the achievements of the business at the regional level. Participants expressed their gratitude to the organizers of the event and called for celebrating others of this kind for it allows them to share ideas and, above all, make the position of the Hotel Butler be more acknowledged and dignified, thus enhancing the quality of the services provided to visitors in the country.